On a global level, the potential for renewable energy is more than sufficient. Problems emerge on a regional level, however, especially in developing Asia and Africa. Renewable energy technology forcing in these regions can have serious socio-economic consequences. We often see images like the one below which imply that the potential of renewable energy is essentially limitless. Thus, if we only had the will, we could easily power the world with clean and everlasting renewable energy. 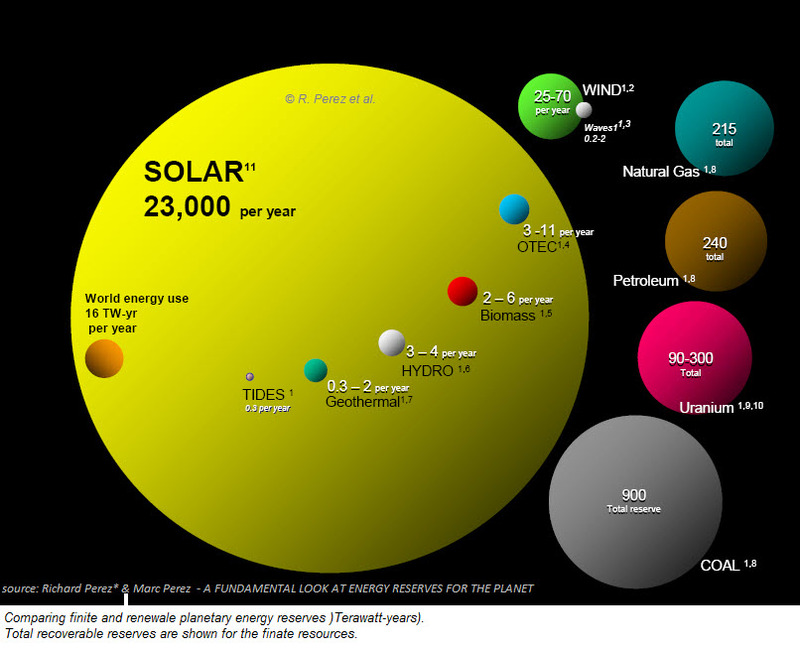 Solar PV is generally viewed as the most limitless of all the renewable energy options. 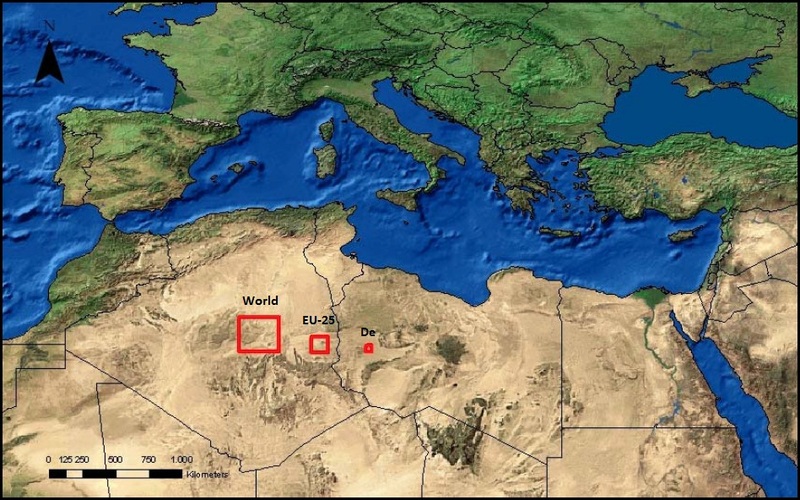 The little squares on the map below shows just how easy it is to power the world with solar. The reality is, however, that realistic renewable energy potential is some orders of magnitude lower than these simplistic illustrations. Firstly, areas covered by urban developments, forests, protected zones, ice, dunes or rock need to be excluded. In addition, areas with excessive slope or elevation are also not eligible build sites. After these eliminations, only areas with a sufficiently strong solar irradiation and wind speeds can be considered. From the remaining land area, only a small fraction can be used before serious social resistance or natural habitat interference is encountered. For example, only about 1-2% of available land area is covered by onshore wind in European countries like Denmark, Germany and the Netherlands, but these issues are already becoming significant. All of these factors have recently been quantified in a very interesting study published in the Elsevier journal “Global Environmental Change”. Findings from this study are further discussed below. 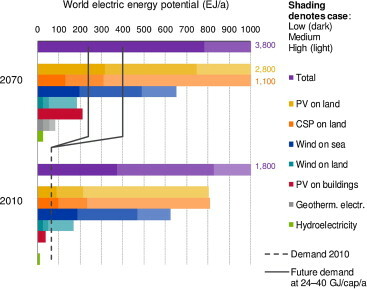 Even after all of these realistic assumptions, the total global wind and solar resource still easily meets projected demand by the year 2070 even under the most pessimistic assumptions (the dark bands in the graphs). It is clear that PV, CSP and offshore wind hold the greatest potential. 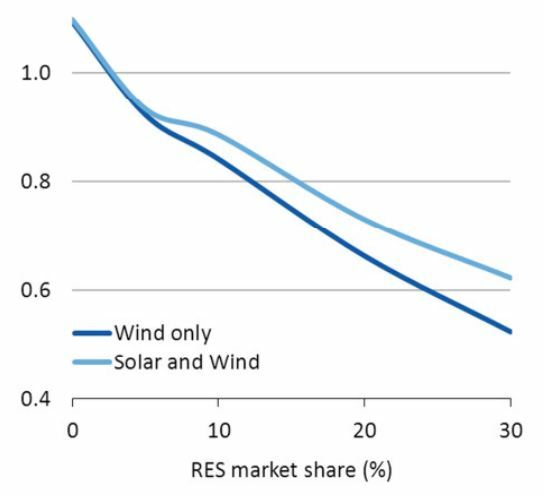 Onshore wind has a much smaller potential, however, especially under low (3%) and medium (6%) land availability assumptions. PV on buildings also has quite a large potential in the year 2070 due to assumptions of large urban buildouts and large gains in solar panel efficiency (35% in 2070). 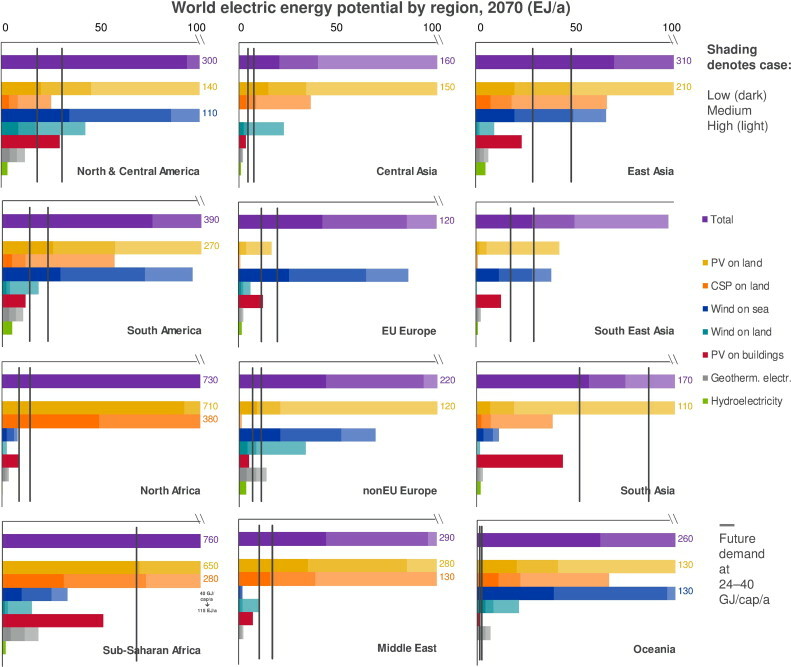 The projected electricity demand by 2070 is set within the range of 24-40 GJ/person/year. For perspective, the average American currently consumes about 44 GJ of electricity per year and electricity accounts for only about 20% of final energy consumption. 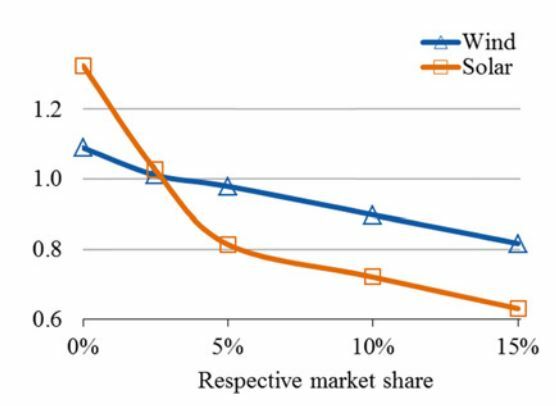 Offshore wind and rooftop solar are about twice as expensive as onshore wind and utility-scale PV for obvious reasons. In addition, the development of CSP has been slower than anticipated. It should be mentioned, however, that the low-cost inclusion of thermal energy storage in CSP significantly increases its value. Given these considerations, most regions around the world will have a very tough time achieving high market shares of renewable energy. 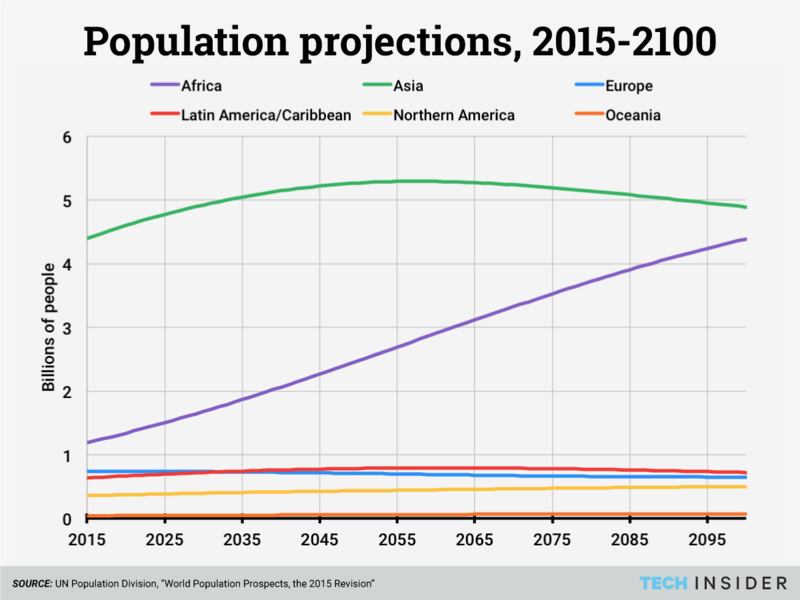 The two most populous regions in 2070: Sub-Saharan Africa and South Asia will have to rely heavily on solar power. If solar thermal technology can be greatly improved, this will help Sub-Saharan Africa, but South Asia will have to rely almost completely on solar PV – mostly the expensive distributed kind. North Africa and the Middle East face similar challenges. The highly populous East Asian, South-East Asian and South American regions can achieve greater balance if they heavily rely on expensive offshore wind. South-East Asia will be especially dependent on offshore wind together with EU Europe. It should be noted that further refinement of the data to a country or state level will further accentuate these challenges. The situation outlined above assumes lots of long distance electricity lines and excellent performance by politicians to establish cross-border regional electricity markets. These regions and their enormous populations still have a lot of industrialization to do. Industrialization is critical to give these people a reasonable quality of life, to shield them against the effects of climate change, and to naturally curb population growth. Unfortunately, industrialization is also an incredibly expensive and resource intensive undertaking. Insisting on driving industrialization primarily through renewable energy will therefore come at a tremendous cost in terms of quality of life, especially given the challenges outlined in the previous section. As a simple example, I estimated the effects of renewable energy technology forcing on economic growth in India as an example at the bottom of this article. The example showed that deployment of only solar and wind to grow Indian electricity production to support economic growth would cut the Indian growth rate in half. After 20 years of this practice, the Indian economy would literally be only half the size it could otherwise have been. This situation will be further worsened given the fact that South Asia will have to rely heavily on expensive distributed solar PV which will rapidly lose value as market share increases. Such a development strategy is simply not going to happen unless rich nations finance the necessary subsidies. And that is not going to happen any time soon. This article was definitely not written to write off renewable energy. As often stated before, I wholeheartedly support moderate wind and solar deployment in regions where they make sense. For example, the US is one country where renewable energy makes a lot of sense due to its vast available land areas, high quality wind and solar resources, and affluent population. Wind and solar technology forcing in regions with much lower potential and much poorer populations is a completely different story though. I fear that this strategy will be highly inefficient at best and disastrous at worst.